WARNING: This article contains potential spoilers for Star Wars 8. Soon after it was released it became apparent that Star Wars: The Force Awakens featured many famous cameos. One of the bigger names revealed was Daniel Craig - who made a brief but memorable contribution as a stormtrooper - and it looks like Mad Max star Tom Hardy will be following in his footsteps. According to Making Star Wars, Hardy will play the role of a First Order stormtrooper and will share a scene with John Boyega's Finn in Star Wars 8. 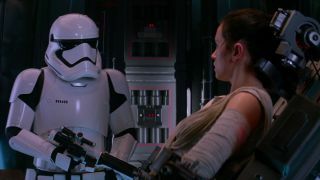 In the sequence, Hardy's character recognises FN-2187 from their time at the Academy and congratulates him on his promotion to Resistance infiltrator and spy before letting him go. This sounds like it could be a really fun moment in the film, but if this rumour is true it also spawns some interesting questions. Specifically, are the First Order keeping Finn's defection secret or did all the stormtroopers who knew about it die when Starkiller Base was destroyed? With confirmation on Hardy's cameo unlikely, we have a while to wait before getting definitive answers. Directed by Rian Johnson and starring Daisy Ridley, John Boyega, Oscar Isaac, Laura Dern, Mark Hamill, Adam Driver, Gwendoline Christie, and Benicio del Toro, Star Wars: Episode 8 opens in cinemas on December 15, 2017. Check out our Star Wars 8 page for more comprehensive info about trailers, release date, cast, plot, theories and much, much more.